Welcome to my Photographic Logbook, a visual chronicle of my experiences as a private pilot, aircraft owner, and father of a young aviatrix. 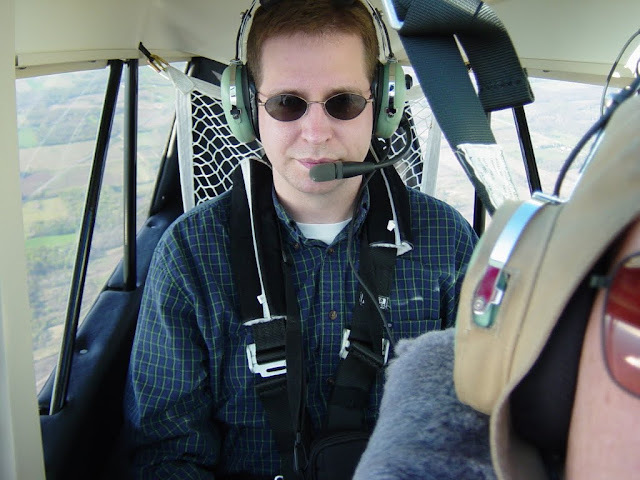 I am a private pilot based at the Williamson-Sodus Airport (KSDC) on the south shore of Lake Ontario in Upstate NY. I also identify as a husband, father, mass spectrometrist, amateur photographer, smart alec, dyed-in-the-wool geek, and hobbyist author. 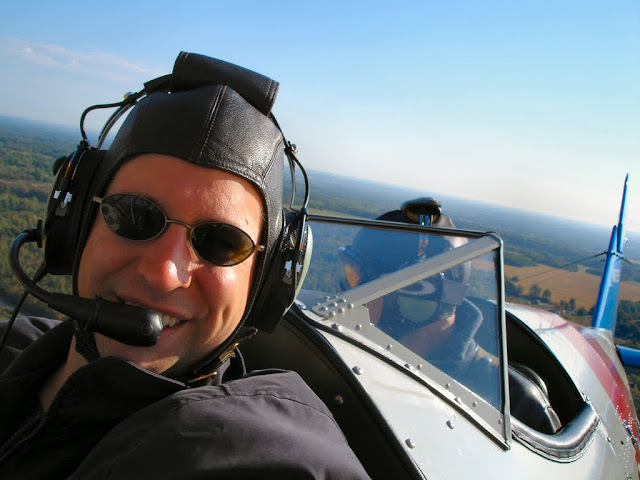 What I am not is a certified flight instructor, so feel free to take anything in this blog with an appropriately sized grain of salt (be conservative, make it a big one). My official logbook is a prized possession; a concise by-the-numbers memoir of past adventures, airplanes flown, hours elapsed, and places visited. But a big part of my passion for aviation is inspired by the imagery of flight and that is why this blog exists. This blog is a (mostly) visual chronicle of my flying experiences. I started it in 2003 as a hand-coded website full of photos with short captions. It's also a writing outlet, so the captions got a lot longer over time. Me flying from the back seat in Dave's Decathlon, May 2003. Photo by Dave. I fly because, while at the controls of an aircraft, earthbound worries stay on the ground. My wife's version of this statement is that "flying is therapy" for me. She's right - health insurance companies should reimburse avgas for mental healthcare. I fly because soaring through the sky in control of my own destiny is the realization of a childhood dream. I fly (and take pictures) because, from above, the Earth can be dazzlingly beautiful. And even when it's not, it is still fascinating to see the everyday world from such a different perspective. I fly because, more than anything else I have ever experienced, aviation blends science and art in a way that inspires passion. I don't expect everyone to understand my passion for flight. There will always be those who view light aircraft as unnecessary, dangerous toys for the reckless and wealthy. Although exceptions exist for everything, this is not really an accurate stereotype. First, the average aviator is far more safety conscious and aware of his surroundings than the average driver and reckless pilots quickly find themselves as pariahs in the pilot community. Moreover, most pilots (at least the ones I know) are not particularly wealthy, but have worked hard and made financial sacrifices in other aspects of their lives to follow their dreams. The truly wealthy are more likely to be chauffeured in a private jet than found at the controls of a 30+ year old single engine Piper. That whole story can be found here. Dave, "The Instigator". Scientist, docent, and mentor. All this madness is entirely his fault. Kent, my partner in crime during training. I've known and worked with Kent since 1994 - at three different organizations in three different states. What are the odds? Ray, owner and operator of the Le Roy Airport and my own personal Patron Saint of Aviation. 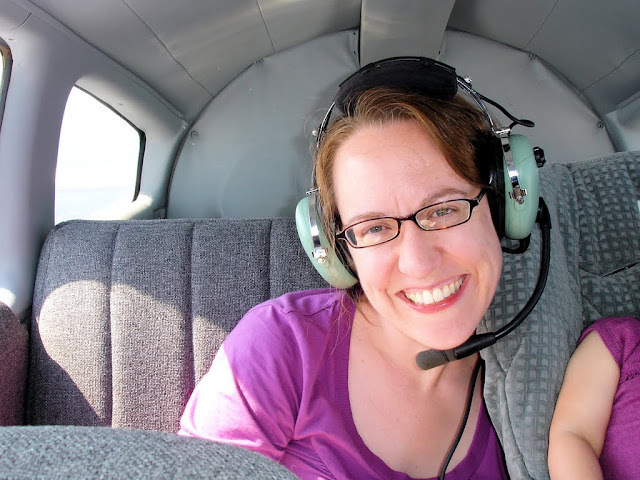 Kristy, my wonderful, supportive wife and occasional copilot. The Bear (as in "don't poke the..."), my daughter, who is always game for an airplane ride. The Bear has been flying with me since she was five weeks old. Darrell and his beautiful Cessna Skyhawk, my constant companions during instrument training. Nothing fancy, mostly point-and-shoot digital cameras of varying capability over the years. Honestly, because I am busy flying most of the time, anything fancier than a basic point-and-shoot is overkill. Every once in a while, an iPhone photo sneaks in there, too. All pictures in the site were taken by me unless otherwise noted. 1. Situational awareness comes first. Most of my shots are taken without looking through the viewfinder and should not pose even as much distraction as switching frequencies on the radio. If the photos don't turn out...that's fine. Electrons are cheap. 2. The best photos are taken through an open window. If this isn't possible, place the camera lens close to the window...preferably a clean area...to minimize reflections. 3. The best aerial photos are usually obtained when the sun is low on the horizon and with the sun at your "back". Low angle sunlight tends to accentuate the contrast of ground features and generate warm colors. - Set your digital camera for maximum resolution - you can always crop out what you don't want after the fact. The caveat here is that you need a good size memory card, but these are inexpensive. - Force the focus to infinity before you start flying. This is particularly important when shooting through a window so that the camera doesn't focus on a scratch or a bug. Unless you're taking pictures of your passengers or your panel, everything else will be far away. - Optical zoom is wonderful, but disable any digital zoom function. All this does is crop your photo and you'll have better control of that in post-processing software than while while flying an airplane (see #5). 5. Get some decent photo editing software to help you zoom, crop, and rotate. Blind shots out the window do not lend themselves to well-framed photos! Most software has color balancing features that can remove blue or green tints caused by aircraft windows. For me, the idea is not so much artificial alteration of the image, but adjustment back to something more representative of what I actually saw when I opened the shutter. I have used Paint Shop Pro X for the last several years and it works well for me. Paint Shop has a terrific "horizon" feature that allows you to identify the horizon by drawing a line on it, after which the software will rotate the horizon to level and crop the image to an appropriate aspect ratio. Simple, but I use this feature often. 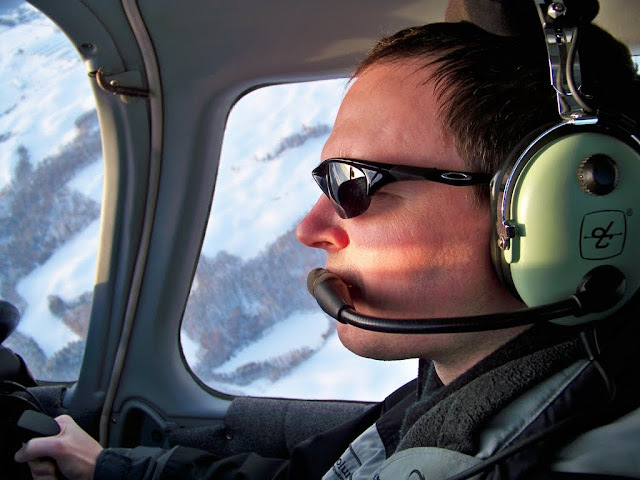 May 30, 2008: I had just landed as pilot in command at the highest elevation airport in the United States. Getting my photo taken with this iconic mural was a must. The photo was taken by Reuben, my aeronautical sherpa in the Rocky Mountains. You can read about it here.